17 Year Old Madison - Improved mood, coping. Fox 5 News Report - Click on Video Above to listen to the 3 minute Fox 5 News Flash regarding the EMPower Plus - Q96™ Supplement Discovery. EMPowerplus Q96™ is designed to promote mental well-being by providing a broad-based balanced supply of micronutrients needed for healthy brain function and development. Research increasingly indicates that a lack of vitamins and minerals can lead to increased stress and anxiety. 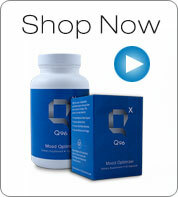 EMPower Plus Q96™ is powerful brain food specially formulated to offset these deficiencies. A proprietary formula of 36 vitamins and minerals, Q96 delivers nutrients in a dosage that supports mood stability, cognition, and overall brain health. Follow the buttons below to learn more or click "Shop Now" to try what has been heralded by the news media as "how people with mental illness can live meaningful and purposeful lives." EMPower Plus™ - Q96, the most researched MicroNutrient in the world is unlike any other multi-vitamin and mineral supplement. The most respected evidence-based reports available to medical professionals that highlight new advances in the medical field. Research has been published in 20 medical journals over the past decade proving the effectiveness of the Q96™ formulation. The founders have been approached by 41 independent researchers over the last decade who have contributed to ongoing studies. The EMPower Plus™ - Q96 formulation has been studied around the world including at 15 renowned universities. Since the reach of the EMPower Plus™ - Q96 research has been phenomenal, it has spread throughout the world and has taken place across North America, Europe, and Australia. Wholesale - Preferred Customer Pricing Available. *If you are under the current care of a physician, please consult with him/or her before embarking on any supplement program.